ASU Library's online archive collections show commitment to open access. Uncomfortable as it may be, one way to avoid the mistakes of the past is to confront them — one of the reasons preservation of historical documents is so important, said Arizona State University archivist Robert Spindler. This year marks the 75th anniversary of President Franklin D. Roosevelt’s executive order that cleared the way for the forced relocation of Japanese-Americans to internment camps during World War II, a dark chapter of U.S. history that underscores the fact that xenophobia is not a recent phenomenon. During the past couple of years, Spindler (pictured above) has helped to digitize a rare collection of newsletters and photographs from Arizona’s Japanese internment camps. The collection, a collaboration between the ASU Library Arizona Collection and the Arizona State Library, Archives and Public Records, contains more than 5,000 pages of bilingual camp newsletters, now publicly available and text-searchable via the ASU Library Digital Repository. The collection tells the everyday life stories of the tens of thousands of Japanese-Americans interned in Arizona’s two campsMore than 13,000 Japanese-Americans were sent to the Gila River War Relocation Center, southeast of Phoenix on the Gila River Indian Reservation, and more than 17,000 were sent to Arizona's other internment camp, the Poston Relocation Center on the Colorado River Indian Tribes Reservation. for three years during one of our country’s most difficult periods. There are stories of baseball games, prom dresses and church services — and stories of soldiers who fought bravely for a country they loved “despite the great tragedy of internment,” as Spindler put it. When Spindler began working on the project in 2015, he had a massive amount of digitized image files that needed to be shrunk in order to be presented online in a user-friendly way. He taught himself how to use Adobe Acrobat to shrink the files and used the software’s optical character recognition feature to make the scanned images text-searchable. The Japanese edition of the Poston Chronicle is part of ASU Library's Japanese Internment Camp Collection. The collection includes copies of the Poston Chronicle, from the Poston camp on the Colorado River Indian Tribes Reservation, and the Gila News-Courier, from the Gila River camp, southeast of Phoenix on the Gila River Indian Reservation. A Saturday, Oct. 2, 1942, edition of the Gila News-Courier. The Gila News-Courier frequently carried Ted Ito's cartoon, "Little Gus." This cartoon is from a special Thanksgiving edition of the newsletter. A table saw made by an internee at the Gila River camp shows the ingenuity of those living in the camps, said ASU archivist Robert Spindler. “[They were] finding workarounds, finding ways to get things done when the resources aren’t always there,” he said. It was wartime, so many commodities weren’t always available to the general U.S. population, much less those in the internment camps. Three female high school graduates in gowns at the Gila River camp in June 1945. A man stands outside his barracks next to a small garden at the Gila River camp in November 1942. Having the collection available online also reduces the handling and associated degradation of the physical copies of the newsletters and photographs. An important aspect of the collection, Spindler said, is that it honors ASU and its partners’ commitment to open access. “There are some organizations who have business models where they digitize materials and they try to generate revenue from the result of that work. Sometimes that’s the only way you can get this work done,” he said. “Then there are other institutions that can build collaborations that are dedicated to open access to material. One thing about the collection Spindler found especially intriguing were the pages of the newsletters that are in Japanese. Collection highlights also include cartoons from the newsletters and special holiday editions. Spindler and colleagues have been gradually acquiring more materials over the years, and he said there’s a possibility they may reach out to the Arizona Historical Society in Papago Park, which has a color motion-picture film documenting the construction of the camps that would make a nice addition. ASU Gammage believes reading and the arts should be shared with everyone. In anticipation of the show, which runs June 20-25 at the iconic Tempe venue, ASU Gammage has hidden 20 copies of the novel in several locations throughout Tempe and Phoenix. “It’s a fun way to connect local communities with the production coming to ASU Gammage in a few weeks,” said Erica Lin, digital marketing specialist for ASU Gammage. Some are hidden in Little Free Libraries, miniature outdoor libraries created as part of a neighborhood book-exchange program. Others are hidden in coffee shops, parks and other unexpected locations. Anyone is welcome to pick up a copy, read it, then pass it on to the next literature aficionado. Each bright orange book is marked with a blue sticker explaining this process. 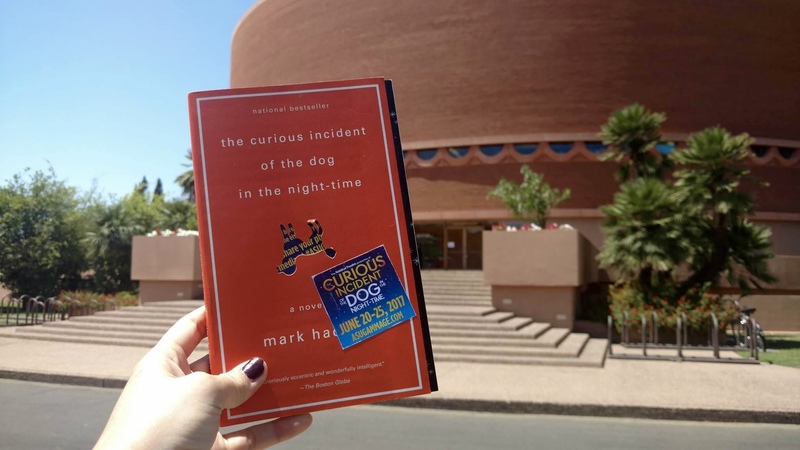 In anticipation of the show "The Curious Incident of the Dog in the Night-time," ASU Gammage has hidden 20 copies of the novel in locations throughout Tempe and Phoenix. Here are hints to some locations; find more on ASU Gammage's Instagram feed. Hint: Don't MITCHELL out on this Little Library, the perfect place to PARK yourself and read a good book. Hint: Drive in your CAR and I will TEL you where to enjoy a hot cup of COFFEE while you read. Hint: Somehow books always find their way back to the library! Hint: This hidden garden is a perfect place to read! Individuals who find a copy of the novel can post photos and share their experience on social media with the hashtag #ASUGammageBookClub. Both the novel and play tell the thrilling story of 15-year-old Christopher John Francis Boone, a highly intelligent young man on the autism spectrum who works to prove his innocence and uncover the true culprit’s identity after he is accused of killing the neighbor’s dog. The play’s North American tour, produced by the acclaimed National Theatre, has been hailed for its immersive and dazzling storytelling. Tickets to "The Curious Incident" are available for purchase at asugammage.com.